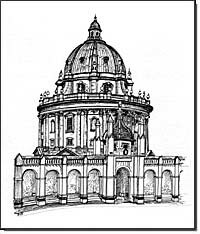 The Radcliffe Camera was designed by James Gibbs as a library and was constructed between 1737 and 1747. It became part of the Bodleian in the nineteenth century. The Bodleian is a copyright library, estimated to contain 3 million books. It began as Duke Humphrey's Library (which is open to visitors), then expanded into the old Examination Schools. Under Radcliffe Square are thousands of book stacks in vaults. In the 1930s a tunnel was built to link the building with the new Bodleian on the other side of Broad Street. The scientific section is called the Radcliffe Science Library and is situated next to the University Museum. The medieval apothecaries' quarter was in the present Radcliffe Square, and the Physic School in Catte Street survived until 1485. John Radcliffe (1650-1715) studied medicine at the University and became a very successful London practitioner and doctor to royalty. He was also a governor of St Bartholomew's Hospital, London. His chief gift to Oxford was the bequeathing of his estate to the University for new buildings and for fellowships, and this is why his name appears so regularly throughout the city. The Camera, Observatory, and Infirmary are all results of his bequest. University College was another beneficiary and had two medical fellowships from the good doctor. He is buried in St Mary's in the High. It was at Wadham College, in the lodgings of the Warden, Dr John Wilkins, that those devotees of the "new" or "experimental" philosophy were to meet during the period following the English Civil War. Christopher Wren, Robert Boyle, John Wallis, and other leading mathematicians and experimenters met together under the auspices of the Philosophical Society at Oxford, formed after Wilkins was appointed Warden of Wadham in 1648 and several other scientists moved to Oxford because of the unrest in London during the Commonwealth. It was this group of eminent scientists that came to form the Royal Society, England's leading scientific institution.